A-Plant, one of the UK’s largest plant, tool, and equipment hire companies, has had a Datatag 4x4 security system fitted to one of its fleet of Ford Ranger service and delivery vehicles. A-Plant hire a vast range of non-operated equipment, from power tools, cement mixers and accommodation units to excavators, compressors, scissor lifts and other types of equipment for industry and construction and the Ford Rangers are used with trailers to deliver equipment to A-Plant customers. A-Plant provides a comprehensive equipment security package as a customer benefit. Many of their machines are fitted with CESAR, the official security and registration scheme, and A-Trak, a machine tracking system. Consequently A-Plant has an enviable 95% recovery rate for stolen machines. The Ford Ranger, belonging to the Milton Keynes Service Centre, was fitted with the new Datatag 4x4 system that contains both overt and covert elements. The unique system gives each vehicle a unique and multi-layered ‘fingerprint’ that cannot be removed by thieves. The kit has sufficient elements to mark a wide range of components on the vehicle. If a vehicle is stolen and stripped for parts, the individual components that have been marked, can still be positively identified. The new system is suitable for all types of 4x4 including, Land Rover Defenders, which are regularly targeted by thieves, and light commercial vehicles. An array of ‘state-of-the-art’ Datatag technology gives each vehicle a unique fingerprint. Technologies include Radio-frequency identification (RFID) transponders, forensic DNA, Datadots, and UV stealth etching technology using special stencils which are used to UV etch component parts and then removed. Overt warning labels are included in the system as a warning to would-be thieves to keep away. The Datatag system, which has to be fitted by an approved installer, takes approximately 40 minutes to fit to the average 4x4 vehicle. Proof of ownership and proof of identity of the vehicle has to be provided by the owner before the kit can be fitted. The Datatag system secures a vehicle for life with a simple and relatively low one-off cost. There are no monthly instalments or annual fees to pay. 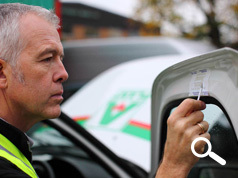 Once the system is fitted and the vehicle registered on the secure Datatag database, it’s protected for life. If the vehicle is sold, the new owner can re-register the vehicle in his name for a nominal one-off cost. The new Datatag car system has Thatcham Quality Accreditation (TQA®). TQA® is a robust verification programme for automotive products, equipment, and services. It concentrates on verifying quality in the manufacture, design, and performance of a product or service. Police forces up and down the country are already equipped with Datatag scanners that can ‘read’ the hidden transponders to help identify the rightful owner even if the registration and VIN plates have been removed. The liquid DNA and microscopic Datatdots®, which are painted around the vehicle body and on various components, are impossible to remove completely and even the slightest trace can lead to a positive identification and recovery. The liquid DNA and microscopic Datatdots® are ideal for use on the valuable components that are easy to remove from the vehicle and to sell-on. The uniquely numbered stencils are designed for use with the special Ultra Violet chemical etching compound that’s supplied in the kit. The stencils are designed to be used on ABS (Acrylonitrile Butadiene Styrene) plastic components like light clusters or glove box lids. The chemical etching process will also work on painted metal and plastic components. 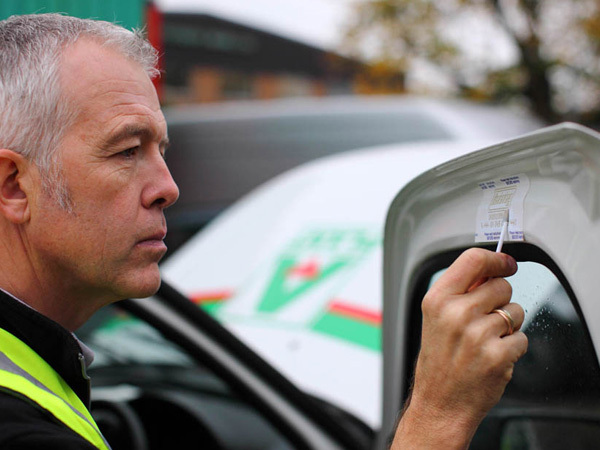 The Datatag security and registration system, for 4x4 and light commercial vehicles, is available through a network of specialist and approved installers. The police recommend Datatag security systems and CESAR security and registration for all types of vehicles, and agricultural and construction equipment.